How can we get the patients’ viewpoint? 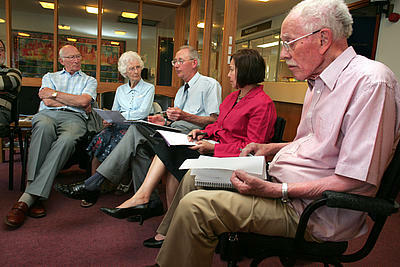 Encourage feedback for the wider public in engagements and patient experience? By becoming a Patient Leader. Gwen Oates, Dementia Cafe Co-ordinator for the Alzheimer’s Society (and now Patient Leader) tells us more about what being a Patient Leader actually means. “Recently I joined the Patient Leader programme that has been developed by NHS Leeds West CCG expertly guided by the CCG’s Engagement Lead, Chris Bridle. “My first foray into the world of being a Patient Leader was when I attended the Summer Base camp held by the Co Creation Network. The aim of the Network is to learn new ways of working better together, testing and supporting change and exploring the answers to those questions which matter most across our health and social care systems. An event is often judged by its lunch and general ambience. Well I can vouch for Horizon Leeds. The venue had an impressive view of the Leeds skyline and we were able to indulge ourselves with cappuccinos and biscuits. There’s a reason why I ponder about the cappuccinos and biscuits because it links to my day job. I was curious to see how links might be made to work being done by the Alzheimer’s Society and Dementia Champions to support people with dementia. We work with a number of organisations to host dementia cafes across Leeds. Jane Pightling gave the opening address in her role as a coordinator for the Yorkshire and Humber Leadership Academy. She introduced the idea of Communities of Practice and luckily there’s a short video showing how to create a Community of Practice. The second speaker Angela Green led a mindfulness exercise. It was great to see a session on mental wellbeing taking place during a conference. What a refreshing thought to consider and help people maintain a sense of mental wellbeing. Further information on mindfulness is available on NHS Choices. I’d already attended a mindfulness session the Jamyang Buddhist centre in Leeds so had a head start here. Some experts suggest that if mindfulness helps those with dementia it must help the rest of us too. How often do we get an idea to stick? Well I was fortunate to hear from Roger Cowell who talked about something called ‘sticky ideas’. Using a simple acronym called SUCCESs he demonstrated how you can get ideas to stick. We heard from other keynote speakers who all gave examples of communities of practice from their particular areas of expertise. This ranged from the national frailty community of practice through to one set up to support those who work in the field of medicine prescribing and/or optimisation. Presentations and resources from the days’ presentations are available from the Co-Creation website. One of the other presentations that struck a chord with me in my role as Patient Leader was one by Matthew Laurie. He spoke about engaging communities by sharing stories. He gave us role descriptions to work out how we could align people’s skills to a role within a Community of Practice. Roles could vary from Activator, Agenda Activist, Community Keeper, Critical Friend, External Messenger or Social Reporter. We were asked to move around the room to meet other people and make connections. This seemed a key way to think about how to ask people to engage and contribute by drawing on their strengths. By drawing on different perspectives we, as Patient Leaders, can champion the cause of people from our diverse communities. As a Patient Leader I’ve now become aware of how we can all bring different perspectives to help those who plan and fund (commission) services. With this in mind I want to highlight an event I attended prior to the Summer Basecamp in the hope that we can consider the needs of people with dementia and their carers. The previous Thursday I attended the ‘Ahead of the Game in Dementia’ event organised by the Yorkshire and Humber Strategic Clinical Network. It was a great day for sharing best practice amongst 200 delegates. The optimistic buzz in the room and great take away resources made it a memorable event. One of the speakers that I had connected with on Twitter gave her personal account of living with dementia. Her presentation was rapturously applauded. 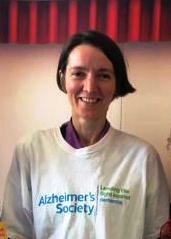 Wendy once worked for the NHS and is a keen supporter of Dementia Research . I learned about the Dementia Engagement and Empowerment Project which provides guides to support the involvement of people with dementia. Read more about that day in Tony Kane’s blog. NHS Leeds West Clinical Commissioning Group have 35 patient leaders of which 16 are actively sitting on steering groups for a range of projects. This includes the chronic pain group, childhood asthma, end of life care and so many more. For the first quarter of this year,January to March, patient leaders collectively volunteered a whopping 260 hours of their time. This entry was posted in Choice, Information, Integration, volunteering, Working together and tagged choice, consultation, feedback, information, integration, Support, volunteer. Bookmark the permalink.